Eric Banadinović (born 9 August 1968), known professionally as Eric Bana (/ˈbænə/), is an Australian actor and comedian. He began his career in the sketch comedy series Full Frontal before his first movie, comedy-drama The Castle (1997), got him noticed by global audiences. Soon after he gained critical recognition in the biographical crime film Chopper (2000). After a decade of roles in Australian TV shows and films, Bana gained Hollywood's attention for his performance in the war film Black Hawk Down (2001) and the title character in Hulk (2003). He has since played Hector in the movie Troy (2004), the lead in Steven Spielberg's historical drama and political thriller Munich (2005), Henry VIII in The Other Boleyn Girl (2008), and the villain Nero in the science-fiction film Star Trek (2009). Bana also played Henry De Tamble in The Time Traveler's Wife (2009). In 2013, he played Lt. Cmdr. Erik S. Kristensen in the war film Lone Survivor and in the following year he played police sergeant Ralph Sarchie in the horror film Deliver Us from Evil. Bana was born in Melbourne, Australia. His father, Ivan, was Croatian and worked as a logistics manager for Caterpillar Inc., and his German mother, Eleanor, was a hairdresser, originally from near Mannheim in Germany. He has one older brother, Anthony. Bana grew up in Melbourne's Tullamarine, a suburban area on the northern edge of the city, near Melbourne's international airport, and attended Penleigh and Essendon Grammar School. In a cover story for The Mail on Sunday, he told author Antonella Gambotto-Burke that his family had suffered from racist taunts, and that it had distressed him. "Wog is such a terrible word," he said. He has stated: "I have always been proud of my origin, which had a big influence on my upbringing. I have always been in the company of people of European origin". Showing acting skill early in life, Bana began doing impressions of family members at the age of six or seven, first mimicking his grandfather's walk, voice and mannerisms. In school, he mimicked his teachers as a means to get out of trouble. As a teen, he watched the Mel Gibson film Mad Max (1979), and decided he wanted to become an actor. However, he did not seriously consider a career in the performing arts until 1991 when he was persuaded to try comedy while working as a barman at Melbourne's Castle Hotel. His stand-up gigs in inner-city pubs did not provide him with enough income to support himself, however, so he continued his work as a barman and waiting tables. In 1993, Bana made his television debut on Steve Vizard's late night talk show, Tonight Live. His performance gained the attention of producers from the sketch comedy series, Full Frontal, who invited him to join the show as a writer and performer. During his four years on the show, Bana wrote much of his own material, and based some of his characters on members of his family. His impressions of Columbo, Arnold Schwarzenegger, Sylvester Stallone, and Tom Cruise made Bana popular with the show's audience. This success led him to record the comedy album Out of Bounds in 1994 and to host his own television special, titled Eric, in 1996. The show, a collection of sketches featuring everyday characters, prompted him to launch a sketch comedy series The Eric Bana Show. The series, written and performed by Bana, featured skits, stand-up and celebrity guests, but failed to attract a substantial audience and was cancelled after only eight episodes due to low ratings. Even so, in 1997, he received a Logie Award for "Most Popular Comedy Personality" for his work on the show. That same year, Bana made his film debut in the Australian film The Castle, which tells the story of a Melbourne-based family's struggles to keep their home by Melbourne's airport as the airport authority force them to move. He was featured in a supporting role as Con Petropoulous, a kickboxing accountant who is the householder's son-in-law. The Castle was a surprise critical and financial success, earning A$10,326,428 at the box office in Australia. In 1997, in spite of his lack of experience in dramatic roles, Bana was approached by director Andrew Dominik to appear in the film Chopper (2000), a biographical film based on the life of infamous Australian criminal Chopper Read. Dominik had been working on the project for five years, but was unable to find an actor to portray Read. Only after Read himself suggested Bana, having seen him perform a skit on television, did Dominik consider him for the part. For the role, Bana shaved his head, gained thirty pounds, and spent two days with Read to perfect his mimicry. During filming he arrived on set at four in the morning and spent five hours being covered in Read's trademark tattoos. In spite of the film's limited release outside of Australia, Bana's performance received positive reviews. American film critic Roger Ebert complimented Bana, stating that "in a comedian named Eric Bana the filmmakers have found, I think, a future star ... He has a quality no acting school can teach you and few actors can match. You cannot look away from him". Chopper was a critical and financial success in Australia, and was nominated for Best Film at the Australian Film Institute Awards in 2001. Bana's performance won the Australian Film Institute Award for Best Actor. In 2001, director Ridley Scott cast Bana as an American soldier in the film Black Hawk Down (2001). Scott, with a recommendation from Russell Crowe and impressed by Bana's performance in Chopper, did not require him to audition. In the film, he played Sergeant First Class Norm 'Hoot' Hooten, an elite Delta Force soldier, who fights his way out of a battle in Mogadishu, Somalia after a mission to capture two top lieutenants of a renegade warlord goes awry. Bana shed the weight he had gained for Chopper and began an exercise regimen months before filming began. He also trained with Delta Force operators at Fort Bragg, learning to fire weapons and clear rooms. Bana's next project was the low-budget Australian film The Nugget (2002). A comedy, the film portrays the effect of instant wealth on three working class men and was released with moderate success in Australia. Bana read the script after filming Chopper in 2000 and was drawn to it because it reminded him of his childhood and because he found its characters amusing and likeable. While filming The Nugget, Bana was offered the lead role of Bruce Banner in the film adaptation of the popular Marvel Comic book series The Incredible Hulk. Only after learning of director Ang Lee's involvement in the project did he consider the role. Bana admired Lee for his work on the film The Ice Storm and agreed to work on the film before the final script was complete. He said he was drawn to the film because "the character of Bruce Banner had dramatic potential" and was "a fairly non-traditional superhero". Hulk (2003) received mixed reviews and a moderate success at the box office, but Bana's performance was praised: Jack Matthews of the New York Daily News felt that Bana played the role of Bruce Banner "with great conviction". Bana earned an Academy of Science Fiction, Fantasy & Horror Films nomination for "Cinescape Genre Face of the Future" for the film. In 2004, Bana co-starred with Brad Pitt in the big-budget film Troy. In the film, he played Prince Hector, leader of the Trojan forces battling against the Greek warrior Achilles. The film was an international success, grossing US$364 million, with US$133 million in the US. After the critical disappointment of Hulk and Troy, critics questioned Bana's bankability in big-budget films. He responded in Empire Magazine: "It's not like it [Hulk] was a flop. When you're on a long shoot it is a long personal investment. If I wasn't happy with the end result I'd be bloody upset, but in every case so far I've been happy. Troy could take $50 and I wouldn't regret it." The following year, Bana co-starred with Daniel Craig and Geoffrey Rush in Steven Spielberg's controversial film Munich. Bana played Avner, a Mossad agent, who is ordered to track down and kill the Black September terrorists thought to be responsible for the massacre of Israeli athletes at the 1972 Summer Olympics. The film was a critical success, and was nominated for five Academy Awards in 2006. The Los Angeles Times wrote that Bana as Avner "projects a combination of sensitivity and ruthlessness and ... knows how to present a face for which worry is a new experience." In 2006, Bana was invited to join the Academy of Motion Picture Arts and Sciences. Lucky You, a romantic comedy on which Bana worked before filming Munich, was released in early 2007. In the film, he played Huck Cheever, a professional poker player who must overcome his personal problems to win a high-stakes tournament in Las Vegas. His next film was the Australian drama Romulus, My Father (2007). The film, based on Raimond Gaita's memoir of the same name, portrays a couple and their struggle in the face of adversity to raise their son. The film was a critical success, and Bana's performance earned him a second Australian Film Institute Award for Best Actor. In 2007, he also returned to his Australian TV roots by appearing in hit comedy Kath & Kim as himself. Bana's next project was the historical drama The Other Boleyn Girl (2008). In the film he played Henry VIII of England opposite Scarlett Johansson and Natalie Portman. Bana was surprised to be offered the role and admitted that he "probably would have just passed it on without even opening it" if it had been presented to him under a different title. The following year, he co-starred with Chris Pine and Zachary Quinto in the science fiction film Star Trek. In the film, Bana played Nero, a Romulan mining ship captain who attempts to exact revenge on Spock, whom he blames for the destruction of his homeworld and its inhabitants. The film was a critical success and grossed over US$380 million worldwide. In August 2009, he appeared as Henry DeTamble in the film adaptation of The Time Traveler's Wife. Bana also co-starred with Adam Sandler and Seth Rogen in Judd Apatow's third directorial feature, about stand-up comics, titled Funny People, marking Bana's first appearance in an American mainstream comedy. In 2009, Bana released a self-produced and directed documentary-style film called Love the Beast. It details his personal relationship with his first car and follows his progression as a car lover. Along the way he seeks guidance and wisdom from the inner sanctum of his three lifelong friends, as well as celebrities Jay Leno, Jeremy Clarkson, and Dr. Phil. In 2011, Bana appeared as ex-CIA operative Erik Heller in the action thriller film Hanna, starring alongside Saoirse Ronan and Cate Blanchett. The film became another success for Bana as it opened at No. 2 at the United States box office. Having read Marcus Luttrell's autobiographical account as a United States Navy SEAL, Lone Survivor, he was willing to appear in the 2013 film adaptation regardless of which role he was offered. In the film, he portrayed Lieutenant Commander Erik S. Kristensen. The following year he starred as Ralph Sarchie, a police sergeant who investigated paranormal cases, in the supernatural horror film Deliver Us from Evil. The film was released on 2 July 2014 and grossed US$87.9 million worldwide. In April 2016, he starred as Frank Bonneville, a struggling radio journalist, in Ricky Gervais' Special Correspondents on Netflix. In Guy Ritchie's King Arthur: Legend of the Sword (2017), Bana took on the role of Uther Pendragon, king of Britain and father of future King Arthur. In 2018, Bana starred as John in the Bravo mini-series Dirty John based on the Los Angeles Times story and hit podcast. In 1995, while working on the television series Full Frontal, Bana began dating Rebecca Gleeson, a publicist with the Seven Network and daughter of then Chief Justice of New South Wales, and later Chief Justice of Australia, Murray Gleeson. They married in 1997, after Bana proposed to her on a trip to the United States, which he won from Cleo Magazine after being named their "Bachelor of the Year" in 1996. Bana and Gleeson have two children, a son, Klaus (born August 1998), and a daughter, Sophia (born April 2002). They are based in Melbourne. On official identity documents he still has his birth surname, Banadinović. Bana is a motor racing enthusiast, and participates in various motor racing competitions in Australia. At the age of 14, he wanted to leave school to focus full-time on becoming a motor mechanic, but his father convinced him to complete school, advising him to avoid making his hobby a job. Bana purchased his first car, a 1974 XB Ford Falcon coupé, at the age of 15 for A$1100 and, driving it, made his motor sport racing debut in Targa Tasmania 1996, a week-long race around Tasmania. (Bana has had this car for more than a quarter century. In 2009 he released a documentary named Love The Beast. The film details the central role that racing and fixing this same car has played in his life and the lives of his friends.) In 2004, Bana purchased a Porsche 944 to compete in Australia's Porsche Challenge. Competing throughout 2004, he often finished in the top ten and in November, finished fourth at the Sandown event, a personal best. On 21 April 2007 Bana crashed his 1974 XB Falcon Coupe in the Targa Tasmania rally. Neither he nor his co-driver were injured. Bana appeared on the British motoring show Top Gear on 15 November 2009 as a guest for its "Star in a Reasonably Priced Car" segment. Bana is a prominent fan of Australian rules football. His love of the sport began at a young age when his godfather took him to games to see the St Kilda Football Club, his favourite team in the Australian Football League. Bana can often be seen at AFL games when he is back in Australia. Bana's love for St Kilda FC resulted in the club being featured in the film Funny People and in Bana's promotion of the film in 2009, notably on NBC's Late Night with Jimmy Fallon. In 2010, Bana was named the "Saints Number One Ticket Holder". Bana is an ambassador for Father Chris Riley's charity for homeless young people, Youth Off The Streets, and has appeared with Riley in advertisements to support the organisation's annual appeal. Bana is also an advocate for the Mental Illness Fellowship, which works to increase the awareness of mental illness in Australia. In 2004, he appeared in several high-profile advertisements for the fellowship. Bana is also active in campaigns with the Australian Childhood Foundation and the Bone Marrow Donor Institute. Since 1995, he has participated in the Motorcycle Riders Association Toy Run in Melbourne, which raises money and toys for needy children at Christmas. In 2005, Bana narrated the documentary Terrors of Tasmania about the endangered Tasmanian devil. The film followed the life of a female Tasmanian devil called Manganinnie and discussed the incurable facial cancer which threatens the survival of the species. He has also worked with the Royal Society for the Prevention of Cruelty to Animals, donating money to animal shelters in Berlin while filming Troy in 2004. In 2007, Bana introduced the episode Some Meaning in This Life of the ABC-TV documentary series Australian Story. The episode paid tribute to Australian actress Belinda Emmett (who co-starred with Bana in the film The Nugget) and her long struggle with cancer to which she had succumbed the previous year. ^ a b c d "Eric Bana". Lauren Bergman Management. 2014. Archived from the original on 28 August 2007. Retrieved 10 June 2016. ^ "Eric Bana, porijekom Hrvat, novi James Bond?" 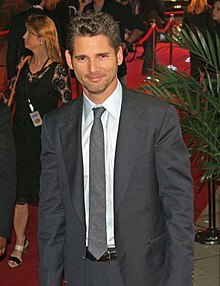 [Eric Bana, a Croat in origin, the new James Bond?]. Index.hr (in Croatian). 2 August 2004. ^ a b Wills, Dominic. "Eric Bana – Biography". www.talktalk.co.uk. TalkTalk. Archived from the original on 26 April 2015. Retrieved 7 May 2010. ^ a b c d e Wills, Dominic. "Eric Bana – Biography". Tiscali Film & TV. Archived from the original on 14 February 2009. Retrieved 15 March 2008. ^ Gambotto-Burke, Antonella (8 February 2009). "Never mind the Hulk: Eric Bana on his 25-year obsession with 'the Beast'". Mail Online. Retrieved 8 March 2010. ^ "Eric Bana". Marie Claire. March 2002. ^ Johnson, Tony (19 June 1994). "Bana Banks on Banter". Herald Sun Sunday TV Extra. ^ Houston, Melinda (29 September 2002). "Eric's Eureka". The Sun-Herald. Archived from the original on 25 October 2009. Retrieved 13 May 2006. ^ Devlyn, Darren. "First Impressions" . TV Weekly. 10 February 1993. ^ a b Halfpenny, Kate. "Under the Gun". Who Magazine. 8 August 2000. ^ Strickland, Christopher (July 2000). "Director's Cut: Andrew Dominik's "Chopper"". If Magazine. ^ Ebert, Roger (1 June 2001). "Review of "Chopper"". RogerEbert.com. Retrieved 14 June 2006. ^ Woods, Stacey (February 2002). "First Buzz: The Incredible Hulk". Elle. ^ a b Hopkins, Mark (April 2002). "Eric Hits Hollywood". GQ Magazine (Australian edition). ^ "The Incredible Rise of Eric Bana". What's on Weekly. Archived from the original on 21 March 2012. Retrieved 31 May 2006. ^ a b Mootram, James (14 July 2003). "Making it Big". TNT Magazine. ^ Mathews, Jack (20 June 2003). "Beast for the Eyes". New York Daily News. Retrieved 22 November 2014. ^ "Awards for Eric Bana". Internet Movie Database. Retrieved 15 March 2008. ^ "Troy". Box Office Mojo. Retrieved 2 June 2006. ^ Eimer, David (June 2004). "Heroes of Troy: Eric Bana". Empire Magazine. ^ "Bana Republic". The Irish Times. 20 January 2006. Archived from the original on 24 September 2015. Retrieved 1 July 2006. ^ Murray, Rebecca (23 December 2005). "2006 Academy Award Nominees and Winners". About.com. ^ Turan, Kenneth (23 December 2005). "Movie Review: 'Munich'". Los Angeles Times. Archived from the original on 2 February 2010. Retrieved 9 April 2009. ^ "Academy Invites 120 to Membership". Academy of Motion Picture Arts and Sciences. 5 July 2006. Archived from the original on 6 July 2006. Retrieved 22 November 2014. ^ "Romulus, My Father sweeps AFIs". ABC News. 7 December 2007. Retrieved 15 March 2008. ^ Fischer, Paul (17 February 2008). "Bana Takes on Kings and Icons". FilmMonthly.com. Retrieved 17 June 2009. ^ "Star Trek (2009)". Rotten Tomatoes. Retrieved 17 June 2009. ^ "Star Trek (2009)". Box Office Mojo. Retrieved 5 September 2009. ^ Flemming, Michael; McNary, Dave (17 April 2007). "New Line finds its cast on 'Time'". Variety. Retrieved 21 February 2008. ^ Fleming, Michael (11 June 2008). "Trio joins Judd Apatow film". Variety. Retrieved 13 June 2008. ^ Lamont, Tom (15 November 2009). "Eric Bana: Me and my car". The Guardian. Retrieved 7 November 2017. ^ Dargis, Manohla (7 April 2011). "Daddy's Lethal Girl Ventures Into the Big, Bad World". The New York Times. Retrieved 7 November 2017. ^ Kilday, Gregg (11 April 2011). "'Hanna' Edges Out 'Arthur' for No. 2 Box Office Spot". The Hollywood Reporter. Retrieved 7 November 2017. ^ Browning, Justine (2013). "Talking To The Cast Of Lone Survivor At The NYC Premiere". We Got This Covered. Retrieved 24 June 2016. ^ Ismay, John (24 January 2014). "Seeing My Friend Depicted in 'Lone Survivor'". The New York Times. Retrieved 24 June 2016. ^ Pringle, Gill (18 August 2014). "My role from hell: Eric Bana on starring in cop drama 'Deliver us From Evil'". The Independent. London. Retrieved 24 June 2016. ^ "Deliver Us From Evil (2014". Box Office Mojo. Retrieved 24 June 2016. ^ Kroll, Justin (31 October 2014). "Eric Bana and Ricky Gervais to Star in Remake of French Comedy 'Special Correspondents'". Variety. ^ White, James (9 October 2015). "Eric Bana Will Be Uther In Knights Of The Round Table: King Arthur". Empire. Retrieved 7 November 2017. ^ Villarreal, Yvonne (8 August 2018). "You liked the stories and podcast. Here's what to expect from 'Dirty John' as a Bravo scripted series - Los Angeles Times". Retrieved 15 February 2019. ^ Northover, Kylie (1 March 1997). "Eric's Secret Love: Going Bananas". The New Post. Archived from the original on 16 December 2010. ^ "Transcript of "The Tonight Show with Jay Leno"". 17 June 2003. Archived from the original on 10 May 2006. Retrieved 1 June 2006. ^ Hawley, Janet (5 May 2007). "Lucky Eric". The Age. ^ "Eric Bana Bloody Brilliant to the Targa in a 351 XB coupe". Street Machine. June 1996. Archived from the original on 16 December 2010. Retrieved 1 June 2006. ^ Naulty, Matt (November 2004). "2004 November: Sandown". Australian Porsche Drivers Challenge's. Archived from the original on 21 March 2012. Retrieved 12 July 2006. ^ "Bana crashes while competing in Australian rally". The Hollywood Reporter. 23 April 2007. Retrieved 10 June 2016. ^ "Episode 1". Top Gear. Season 14. 15 September 2009. BBC Two. ^ Kramp, Leif (24 January 2006). "Eric Bana: "Wo bleiben die leichten Stoffe?"". RP Online (in German). Archived from the original on 16 December 2007. Retrieved 12 July 2006. ^ Freydkin, Donna (9 January 2003). "'Gentle Giant' Bana". USA Today. Retrieved 1 July 2006. ^ "Video: Eric Bana teaches Jimmy Fallon footy". US Footy News. 12 August 2009. Archived from the original on 14 August 2009. Retrieved 11 September 2009. ^ "Bana Becomes Saints Number One". Official AFL Website of the St Kilda Football Club. 25 June 2010. Retrieved 19 June 2011. ^ "Eric Bana jets in from US to film a promotion for Youth Off The Streets with Father Chris Riley". The Daily Telegraph. Sydney. 1 July 2014. Retrieved 22 November 2014. ^ "Celebrities Support MI Fellowship's Biggest Ever Campaign" (PDF). Mental Illness Fellowship of Victoria. 11 October 2004. Retrieved 1 June 2006. ^ Houlihan, Liam (12 December 2004). "Toy Run 2004: Troy Boy Leads the Pack". News.com.au. Archived from the original on 16 December 2010. Retrieved 1 June 2006. ^ "Sympathy for the Devil". The Age. 20 January 2005. Retrieved 1 June 2006. ^ "Eric Visits Berlin Animal Shelter". Monthly Journal: Royal Society for the Prevention of Cruelty to Animals. 9 May 2004. Archived from the original on 16 December 2010. Retrieved 1 June 2006. ^ "Belinda Emmett's Aussie Story". The Daily Telegraph. 23 July 2007. Retrieved 5 August 2016. ^ "1997 Logie Awards". Australiantelevision.net. Archived from the original on 20 April 2014. ^ "AFI | AACTA | Winners & Nominees | 2000–2010 | 2000". www.aacta.org. ^ "AFI | AACTA | Winners & Nominees | 2000–2010 | 2007". www.aacta.org. ^ "Teen Choice Awards 2009 nominees". Los Angeles Times. Tribune Publishing. June 15, 2009. Retrieved July 21, 2014. 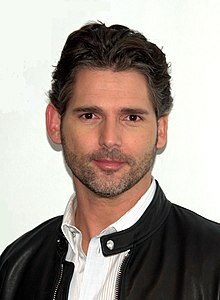 Wikimedia Commons has media related to Eric Bana. Hugo Wallace Weaving is an Australian-English film and stage actor. He is best known for playing Agent Smith in The Matrix trilogy (1999–2003), Elrond in The Lord of the Rings (2001–2003) and The Hobbit (2012–2014) film trilogies, V in V for Vendetta (2006), Red Skull in Captain America: The First Avenger and Tom Doss in Hacksaw Ridge. Weaving's first television role was in the 1984 Australian television series Bodyline, where he portrayed English cricket captain Douglas Jardine. In film, he first rose to prominence for his performance as Martin in the Australian drama Proof (1991). Weaving played Anthony "Tick" Belrose/Mitzi Del Bra in the comedy-drama The Adventures of Priscilla, Queen of the Desert (1994); and multiple roles in the science fiction film Cloud Atlas (2012). His roles as a voice actor include the roles as Rex The Male Sheepdog in Babe, Noah the Leading Elder Emperor Penguin in Happy Feet and Happy Feet Two and as Megatron in the first three films of Transformers film series. Alex Dimitriades is an Australian film and television actor. Shaun Patrick Micallef is an Australian actor, comedian and writer. After ten years of working in insurance law as a solicitor in Adelaide, Micallef moved to Melbourne to pursue a full-time comedy career in 1993. He first gained recognition as a cast member of the sketch comedy show Full Frontal, which led to a number of television roles including his own sketch show, The Micallef P(r)ogram(me), the sitcom Welcher & Welcher and the variety show Micallef Tonight. He also fronted the satirical news comedy series Newstopia on SBS, hosted the game show Talkin' 'Bout Your Generation on Network Ten for four seasons, and Shaun Micallef's Mad as Hell on the ABC. He also co-created and starred in Mr & Mrs Murder on Network Ten. Shane Keith Bourne is an Australian stand-up comedian, actor and a television host. Andrew Dominik is a New Zealand-born Australian film director and screenwriter. He has directed the crime film Chopper, the Western drama film The Assassination of Jesse James by the Coward Robert Ford and the neo-noir crime film Killing Them Softly. Vincenzo Colosimo known professionally as Vince Colosimo is an Australian AFI Award winning stage, television and screen actor. He has worked in both Australia and the United States. He is of Italian descent and currently resides in Melbourne, Australia. Damian Walshe-Howling is an Australian actor, well known for his role as Andrew "Benji" Veniamin in the Australian underworld drama, Underbelly, for which he won the Best Supporting or Guest Actor in a Drama Series at the 2008 AFI Awards. Shane Jacobson is an Australian actor, director, writer, and comedian, best known as the "Dunny Man" for his performances as the eponymous character Kenny Smyth, a plumber working for a portable toilet rental company, in the 2006 film Kenny and the spin-off TV series, Kenny's World. In 2006, he won the Australian Film Institute's Award for Best Actor in a Leading Role for that performance. He currently presents Little Big Shots, on the Seven Network, based on the American series of the same title created and produced by Steve Harvey and Ellen DeGeneres. Funny People is a 2009 American comedy-drama film written, co-produced and directed by Judd Apatow. It stars Adam Sandler, Seth Rogen, Leslie Mann, Eric Bana, Jason Schwartzman, and Jonah Hill and follows a famous comedian who is diagnosed with a terminal disease and tries to fix the relationships in his life. Robert Rabiah is an Australian film actor best known for his roles as Hakim in Face to Face, Nick in Chopper, Dario Mancini in Fat Tony & Co., Spiro Politis on TV soap Neighbours, Mehmet in Deadline Gallipoli, Mohsen in Ali's Wedding, Bilal in Safe Harbour and Sami Almasi in Secret City .